The recorder is designed to preserve data on the flight crew conversations, radio transmissions and sounds heard in the cockpit. 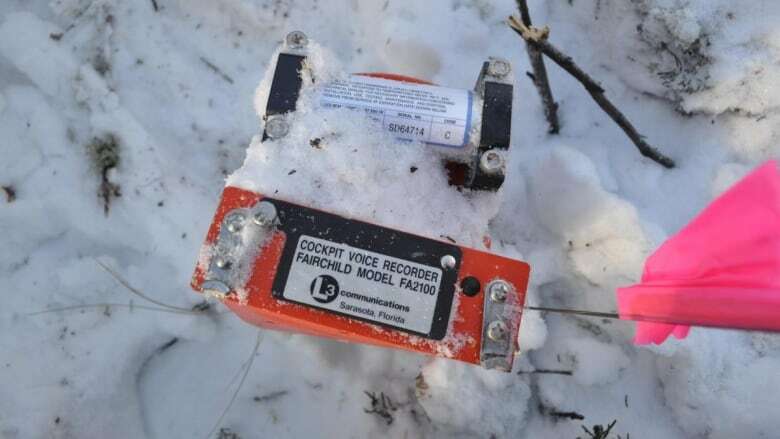 Investigators have recovered the cockpit voice recorder from the wreckage of a fatal airplane crash last month near Whati. The Transportation Safety Board (TSB) announced the find on Monday. It said the recorder will be sent to a lab in Ottawa for analysis. The recorder is designed to preserve data on the flight crew conversations, radio transmissions and sounds heard in the cockpit. In an interview with CBC's The Trailbreaker on Feb. 1, Jon Lee, the regional manager for TSB operations, said the wreckage was found 40 kilometres east of Whati. The TSB says parts of the plane will be recovered and sent to its office in Edmonton for examination. The investigation of the crash is being overseen by veteran TSB investigator Barry Holt. The Jan. 30 crash claimed the lives of the two young pilots, Will Hayworth and Zach McKillop. They were the only people aboard the Air Tindi charter. They were flying from Yellowknife to Whati. The airline lost contact with the plane as it neared the tiny Tlicho community. A search began shortly after that ultimately involved two Twin Otters, a Hercules aircraft from the joint rescue co-ordination centre in Winnipeg, as well as Canadian Rangers from Whati and Behchoko. Despite frigid temperatures and blowing snow, spotters in the Hercules located the wreckage of the plane just before dark Jan. 30. A celebration of life is being planned for Hayworth and McKillop Friday afternoon in Yellowknife.